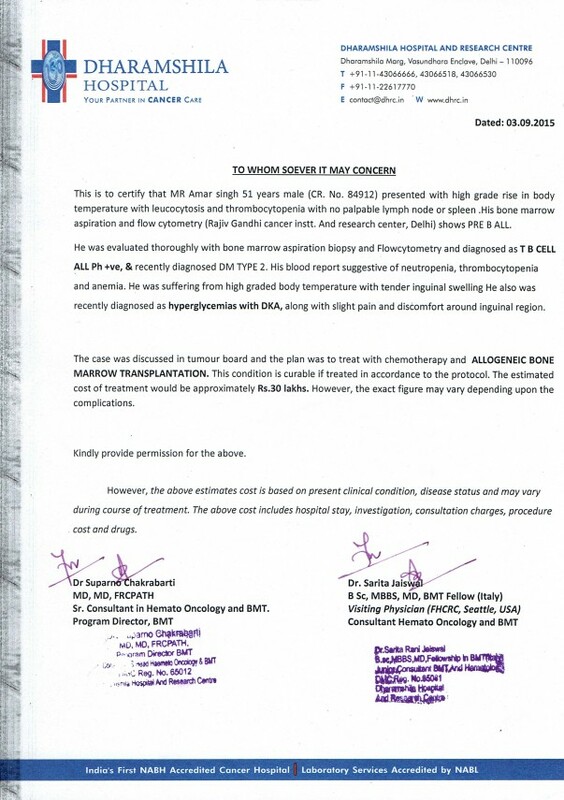 Help Mr. Amar Singh fight leukemia (Blood Cancer). B –ALL, Acute lymphoblastic leukemia, is a type of Blood Cancer but it has come as a nightmare to the family of youngster siblings Jyoti and Vikrant. Their 51 year old father Mr. Amar Singh, is fighting this disease and suddenly it has changed the life of their family in a big way. The growth seekers are struggling now to bring their life back on track and they are not leaving any stone unturned. PRE B-ALL Ph+ve Diagnosed at the age of 51. In August 2015, Mr. Amar Singh, after a short period of illness,was advised by his family doctor to go to a cancer specialty hospital for checkup as he showed the symptoms of this deadly disease. They went to Rajiv Gandhi Cancer Institute & Research Center where the reports confirmed that he is having PRE B ALL. Once confirmed, Vikrant and Jyoti decided to start their father’s treatment in ‘Dharamshila Cancer Hospital and Research Centre, Delhi’ (CR No 84912). The further tests there revealed more problems as DM TYPE 2 (Diabetes) was also diagnosed.Doctors discussed the case in tumor board and shared the plan to treat him with Chemotherapy and ALLOGENIC BONE MARROW TRANSPLANTATION. The Chemotherapy for him has already started and BONE MARROW TRANSPLANTATION has been termed essential due to the complications involved in the case. At this period of age, recovery by the simple treatment is almost impossible and due to diabetes, the chances of relapse are extremely high. The treatment, therefore, has a long way to go and it would require a lot of patience and resources to bring their life back to normal. Jyoti and Vikrant are very young professionals working in IT & Logistics respectively and beginners in the industry. Although they are enthusiastic, the financial burden of the medical costs are way too high and they are the sole earners now in the family. They have a younger brother too who currently continues his study. Given the circumstances, all their family Savings and Insurance have been exhausted till the chemotherapy treatment. Indeed, the BONE MARROW TRANSPLANTATION is a costly treatment but essential for their father at this point; so they have decided not to give up and sail their father back to a healthy life. They continue to fight the battle and need your support and blessings. Every contribution you make, will ease their struggle and will give the confidence to the family to continue the fight with the devastating disease. Thank you all for being a hand of support. The transplant was completed for Mr. Amar and he is doing good. Post-transplant treatment is in progress. With the help of friends, family and your contributions we were able to get the big treatment done. Thanks again for all your support. I am Boaz and I met Vikrant who is fundraising for Amar, his father, who is suffering from Leukaemia. From the time when the disease was found out, Vikrant has handled things very bravely like taking his father to various hospitals. He was the first person in his family to get the news about his father suffering from cancer. 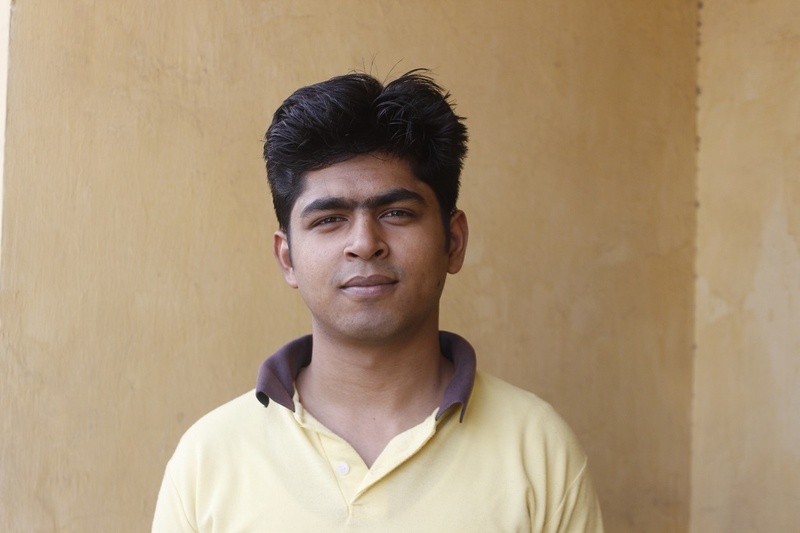 Vikrant is currently working in a startup in Delhi. His father, Amar is currently staying in Yamuna Nagar in Haryana with his family. When Amar underwent a blood test after he had fever, the doctors found something unusual and suggested him to go to Delhi to undergo further tests. After coming to Delhi, he underwent a blood test in Rajiv Gandhi Hospital and came to know about the disease. Someone suggested them to go to Dharamshila hospital to get the bone marrow transplant done and they continued the treatment there. They also tried AIIMS, but were very dissatisfied with the experience as they found the place to be crowded and dirty. Moreover, they were not able to meet the doctors when they wanted. They had to wait hours in line to see the doctors and when the condition grew serious one night, they went to Dharamshila hospital in hurry. 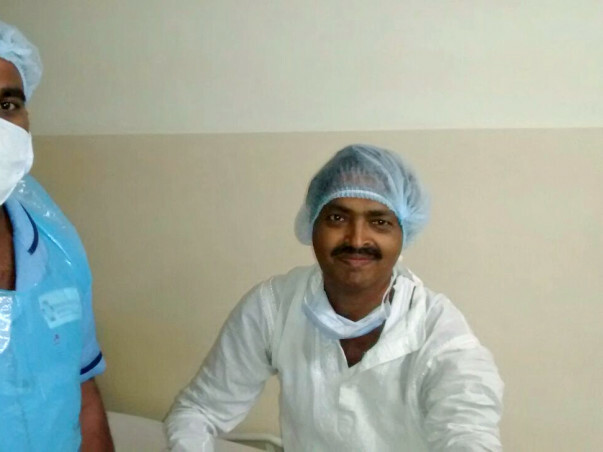 Vikrant donated the cells for the transplant as his cells were matching with his father. The transplant was completed two months ago and Amar is recovering from it. During the diagnosis of cancer, they also came to know that he has diabetes. They weren’t aware of that before and it lead to more complexity in the whole procedure. He now has to take care of his diabetes also. In the first month after the transplant, he went to the hospital twice in a week for monitoring, since the second month he is going once in a week. Amar used to work in a company called Built, which manufactures paper.He has not been going to job since August last year. He has three children and a wife. The expenses which the family incurred till now came to around Rs. 30 lakhs. Most of the amount was used from their personal savings and borrowing from friends and relatives. I've an update to share with you. Mr. Amar Singh is now admitted to the hospital for Bone Marrow transplant. With the help of your support and with aur friend family, we have managed to submit the initial fee required by hospital to go for the transplant. Process for transplant has started and the operation is schedule to happen on tuesday, the 29th of Dec, as of now. The end date of campaign is further increased because we would still be in the need for funds to continue. Please keep forwarding the campaign and pary for the best. Thank you for all your support and prayers so far. May God help with speedy recovery.